Note: Marcasite is not listed in our database for this locality. This specimen may be misidentified or the mindat list of rocks and minerals at this locality may be incomplete. 9.2 x 7.5 x 6.0 cm. 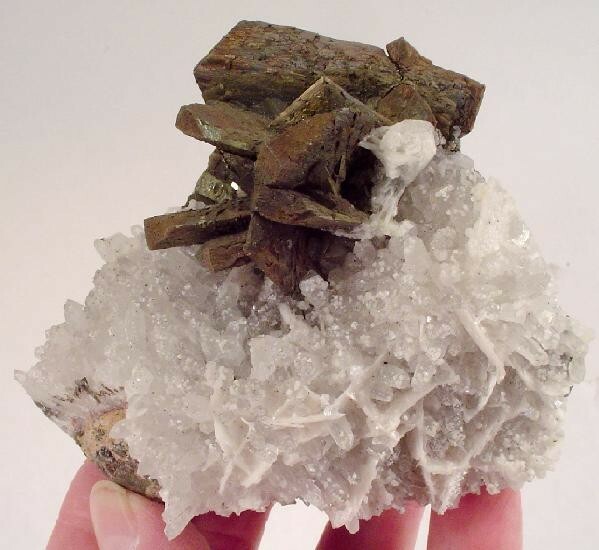 An AESTHETIC and SUPERB cluster of sharp, bronze-colored marcasite blades to 4.7 cm attached to quartz crystal-covered matrix from the Alimon Mine at Huaron, Peru. Huaron is not known for marcasite, so this is really an OUTSTANDING piece. Aesthetically, this is a significant specimen, which is not hugely diminished by the couple of broken marcasite crystals and a bit of edge wear, as you can see. This fine, old-timer resided in the collection of Pete Bancroft from many years.